A coaching program led by Department of Family Medicine and Community Health (DFMCH) faculty Randall Brown, MD, PhD, FASAM; Aleksandra Zgierska, MD, PhD; and Andrew Quanbeck, PhD, helped family physicians in four UW Health clinics better follow opioid prescribing guidelines, resulting in an 11 percent reduction in opioid doses in those clinics. 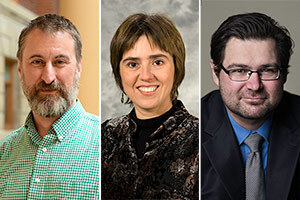 Randall Brown, MD, PhD, FASAM; Aleksandra Zgierska, MD, PhD; and Andrew Quanbeck, PhD, talked with the Wisconsin State Journal about how a pilot coaching program reduced opioid prescribing by 11 percent in four UW Health family medicine clinics. In a February 7, 2018, Wisconsin State Journal article, the researchers described how over six months, they coached clinic teams on three focus areas for patients who take opioids for non-cancer pain: mental health screening, treatment agreements and urine drug testing. Six months after the coaching visits ended, the average morphine milligram equivalent (MME)—the relative potency of an opioid—prescribed to patients at those clinics dropped from 87.1 to 77.2. The average MME increased eight percent, from 62.0 to 67.1, in the clinics that did not participate in coaching. The full study was published in January in the journal Implementation Science: A randomized matched-pairs study of feasibility, acceptability, and effectiveness of systems consultation: a novel implementation strategy for adopting clinical guidelines for Opioid prescribing in primary care. The researchers have applied for a federal grant to expand the program to other clinics statewide.